Right measures and tools are the basics of Trenching and Pest Holes Magill and the most upgraded arrangements are available in Earth Diggers. In case of trenching preparing the place is really important to ensure a smooth dig of the area. For the purpose inspections are made to draft a work plan that will be suitable. The material used determines the quality of the service and Earth Diggers do not compromise in quality. Safety measures are taken to separate the working site from the rest of the area. Pest holes occur in many places and soil is one of the factors for its occurrence. 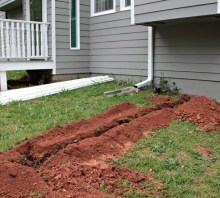 A proper treatment to the soil will help to reduce the problem of pest holes. EARTH DIGGERS is a family owned South Australian earthmoving business with years of experience in the restricted access excavating business located in Adelaide, South Australia. When it comes to excavating around your home we provide professional and affordable services. We specialise in Dingo and Bobcat equipment and home excavations.